Ted's family and staff want to thank you for all of your kind words, condolences and prayers. 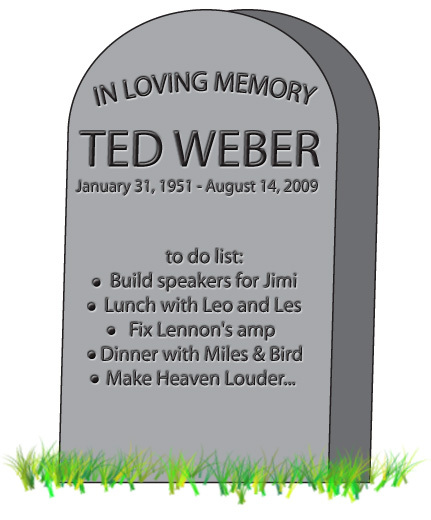 It is a very difficult time, but Ted would want us to keep this train going. I have had the distinct pleasure of working side by side with my Father for the past 14 years, developing this hobby from a handful of speakers sent to a few friends; to a company that has enriched the global music community. Ted's products and designs have gone all over the world to every inhabited continent. Many of his friends who he has helped over these past years, he has never met face to face. He was a teacher to countless musicians and a friend to anyone who needed advice. His memory will live on through the music that these musicians and friends will play for years to come. Ted's legacy will live on through the company that he, TA and the guys have built from humble beginnings in a basement, garage and now our current shop. We feel honored to have this task before us. His shoes will be hard to fill, but we have had a few years to prepare ourselves for this fateful time. In the tradition of how Ted took care of his friends, we are looking forward providing the same quality and friendship to you, our valued customers. You are Ted's family, you knew him as we knew him. Music, speakers and gear were his passion and you shared that with him over the past 14 years, as we have. We want to thank you from the bottom of our hearts; this is not an easy time for us, but we will pick up Ted's guitar and keep playing!